This year Sharif has expressed repeatedly his interest in turning a “fresh page” in relations with India. Since his election he has talked amicably with Prime Minister Manmohan Singh by telephone, invited him to visit Pakistan, and agreed to meet with him in September on the margins of the UN General Assembly. “Instead of spending so much on arms,” he told the press, “[Pakistan and India] should focus on investing in the social infrastructure for the benefit of our people.” Yet on August 8 Indian authorities charged that Pakistani “specialist troops” had ambushed an Indian patrol on the Indian side of the LOC in Kashmir, killing five soldiers. This was arguably the worst violation of the ceasefire agreement between the two neighbors since it was signed in 2003. Both the Pakistan government and the Taliban denied involvement in the attack. Sharif was quick to call for the resumption of the ceasefire and renewed bilateral dialogue, but diplomatic damage had been done. With parliamentary elections due next year in India and the Singh government on the defensive, increased violence along the LOC provides political ammunition for Singh’s political rivals and reduces his latitude for flexibility in bilateral diplomacy. Clearly, elements within Pakistan—including within the government—who oppose Indo-Pakistan rapprochement have easy opportunities to sabotage it. Afghan-Pakistan relations suffer from the same vulnerabilities. As new prime minister, Sharif has pronounced his commitment to supporting a free and prosperous Afghanistan and to facilitating a peace process that is “Afghan-led and Afghan-controlled.” In fact, Islamabad has acceded to Afghan requests that it release specific Taliban militants from prison and assisted with the travel of Taliban spokesmen to Qatar to begin exploratory talks with representatives of the Karzai government. Afghans continue to suspect, however, that the real intent of Pakistan’s security agencies is to ensure that any political settlement in Afghanistan solidifies the influence in Kabul of Pashtun groups patronized by Pakistan and therefore attentive to Pakistani security interests, such as containing the activities in Afghanistan of Indians. Afghan suspicions appeared to be confirmed on August 3, when a team of militants, including three suicide bombers, attacked the Indian consulate in Jalalabad, in eastern Afghanistan. Afghan and Indian security agencies, working together, succeeded in blunting the attack although nine Afghan civilians were killed and more than a score were injured. Spokesmen for the two governments subsequently announced that their combined intelligence pointed to the Lashkar-e-Taiba (LET) as the perpetrator. The LET, declared a terrorist organization by the U.S. government and banned by the U.K., India, Russia, EU and Pakistan, is believed to have been responsible for the 2001 attack on the Indian Parliament and the 2008 attack on Mumbai. There is also persuasive evidence that the premier Pakistani intelligence agency, ISI, has protected the LET for decades, seeing it as a valuable instrument of deniable force projection into India and Afghanistan. In his Eid-ul-Fitr address on August 9, Sharif called on the Pakistani nation to “stand united against extremism and terrorism.” Since then, Sharif’s interior ministry has unveiled a draft of Pakistan’s first-ever national counterterrorism policy. However welcome these public gestures, it is not clear that he can mobilize either the military capacity or the political will to take strong measures against extremist organizations operating in and from Pakistan. The prime minister’s foreign affairs advisor has explained publicly that, because of overstretched military resources, the new administration would pursue dialogue with militants before resorting to military force. “And if that does not work,” he explained, “then we will see under what conditions and by what time frame we will do the alternative actions.” This strategy ignores the fact that multiple peace accords with Taliban elements by past governments have failed, after being exploited by the militants to regroup and strengthen their forces. An even more fundamental question is whether the devout Sharif sees Islamist extremists as enemies or friends. 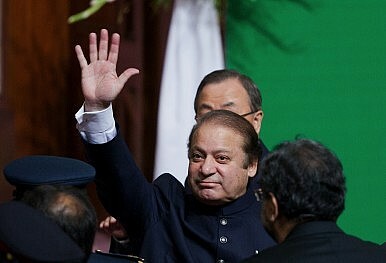 Sharif’s PML-N party historically has been the “natural ally” of religious parties, some of which nurture extremists. The Jamaat-e-Islami (JI), for example, is one of the oldest and most influential proponents of Islamic revolution in South Asia and a supporter of the Taliban. The JI was the strongest partner of the PML-N in the Islami Jamhoori Ittehad, an alliance of nine conservative parties whose support made Sharif’s electoral victory in 1990 possible. Sharif repaid the IJI for its support by expanding the controversial Islamization policies of his political mentor, the former military dictator General Zia ul Haq. Another long-term ally of the PML-N, the Ahle Sunnat Wal Jamaat, operates freely in Punjab, a province controlled by the PML-N, despite being banned in 2012 for sectarian violence. During the recent electoral campaign Sharif never criticized the Taliban by name, and the PML-N was conspicuously excluded from the parties whose candidates were attacked by the Taliban. Hafiz Muhammed Saeed, a founder of the LET and leader of the LET affiliate Jaamat-ud-Dawa, lives and preaches with impunity in Punjab despite a $10 million bounty on him by the U.S. and an extradition warrant by India. LET’s headquarters in Muridke near Lahore, a sprawling 200-acre complex, includes a mujahideen colony. Saeed reportedly has enjoyed the patronage of the Sharif family for decades and is said to receive funding still from the Punjab Government, which is governed by Sharif’s brother Shabaz. Even if Nawaz Sharif were willing to abandon his party’s well-established connections with hardline Islamist groups, he is likely to be deterred by economic and political self-interest from cracking down on their violent activities. Sharif owes some of his personal fortune, much of his political success and possibly even his life to the patronage of the Saudi royal family, which sees him as a reliable defender of Saudi influence and a bulwark against leftists, secularists, and Shias in Pakistan. In 1991, Sharif ensured that Pakistani armed forces participated actively in the First Gulf War, and rushed Pakistani special forces to Saudi Arabia to provide security to the royal family. King Fahd in turn intervened personally with General Musharraf in 1999 to save Sharif, then in jail and under trial for capital crimes, by negotiating a deal that released Sharif to live in Saudi Arabia for ten years. Sharif was flown to exile in Jeddha on Saudi Arabian Airlines, given a comfortable government-owned house, and loaned enough money to establish there an iron and steel mill that today is worth millions of dollars. In 2007, the Saudis rejected Musharraf’s plea that they prevent Sharif from returning to Pakistan. They reportedly argued that if the Pakistan government could permit a secular female leader, Benazir Bhutto, to return to Pakistani politics, it should be willing to permit a conservative Muslim male to return as well. Well-informed Pakistanis have complained since then about the generous levels of Saudi funding to the PML-N, presumably to prevent the PPP, the PML-N’s principal competitor, from being re-elected. What does such foreign patronage mean for the third Sharif administration? It means, for one thing, that the prime minister will be even less inclined than otherwise to take decisive action against Pakistan-based terrorist organizations if they receive Saudi support. The Kingdom of Saudi Arabia (KSA) was one of only two countries, along with the UAE, to join Pakistan in recognizing the 1996-2001 Taliban regime in Afghanistan as a legitimate government—and a strategic victory in a campaign to spread Wahabism throughout the region. Pakistani experts say that the KSA still plays an important role in funding and arming extremist groups such as Ahle Hadith, LET, and Ittehad Islamic Afghanistan, among others, and in building mosques and madrassas that serve as bases for ideological indoctrination and militant recruitment. Unless these organizations can be curbed, significant reconciliation with Pakistan’s neighbors will be difficult, and could become even more difficult. Media sources claim that the KSA also funds the Laskar-e-Jangvi (LeJ), a vicious terrorist organization that targets Shias, both Pakistani and Iranian. The LeJ is reported to have killed or wounded some 3,000 civilians from the Hazara community alone in the past 15 years. It killed more than 400 Pakistani civilians in 2012 and is becoming stronger and increasingly lethal, especially in Balochistan. According to knowledgeable Pakistanis, including clerics, The LEJ is seen by the Saudis and other Sunni donors as a frontline force in a proxy war in Pakistan between Arabs and Iranians, who have been competing for influence in Asia and the Middle East since the 1979 Iranian revolution. Despite the LEJ’s efforts to stoke intense Sunni-Shia violence as a step toward establishing a Sunni theocracy in Pakistan, the leader of the organization reportedly has been acquitted numerous times of charges of culpable homicide and terrorism. On August 18, Sharif ordered an immediate stay of the executions of hundreds of convicted prisoners, including two LEJ killers scheduled to be hanged later in the month. Although moratoria on capital punishment was imposed by earlier leaders, Sharif’s action is seen widely in Pakistan as the continuation of a policy of leniency toward religious radicals. None of this proves, of course, that a politically resurrected Nawaz Sharif will not provide the wise and courageous leadership for change that Pakistan so desperately needs. The strong forces of restraint surrounding him, however, will make reform much more difficult and will require strong countervailing support to overcome. Robert Boggs is a professor of South Asia studies at the Near East South Asia Center for Strategic Studies in Washington, DC. He spent 32 years as US diplomat and intelligence analyst, specializing in South Asia.